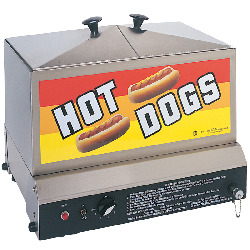 The Hot Dog Steamer is perfect when serving hot dogs at your next event or party! No one has to stand over a grill and wait for the hot dogs to cook. Simply fill the steamer on one side with hot dogs and the other side with buns and let the machine do all the work. Easy and convenient, this is a popular rental so book in advance. Holds 80 regular Hot Dogs and 40 Buns. Our Hot Dog Machine DOES NOT come with any supplies. It is just the machine. Hot Dog Steamer must be operated by an adult at all times and needs to be set-up on a sturdy table or counter. Client will need to supply: ALL HOT DOGS SUPPLIES. This unit requires one motor, which means we will need 1 electrical source within 50 feet of set up. Portable Generator is NOT INCLUDED with any inflatable rental. An electrical outlet will be needed to power any inflatable rented. A Portable Generator can be rented through Charlotte Party Rentals should there will be no power source accessible on the setup area (Call us for some pricing). We look forward to working with you on your next spectacular event! Please complete this form and one of our event specialists will get back to you right away. "May we think of Freedom, not as the right to do as we please, but as the opportunity to do what is Right." Here's wishing you a rocking 4th of July! Stay cool & Celebrate 4th of July with a Twist. We know you want these on your Event! Charlotte Party Rentals was perfect for Our Backyard Baby Shower. Ivy was so helpful during the process. She helped me book everything I needed and offered upgrades on the basic package. They delivered the Tent, Tables and Chairs a full day ahead of time so we weren't rushed to set up. And they picked up all the equipment the next day. I will definitely use them again!!! Make Today Your New Favorite Day! Copyright 2018 Charlotte Party Rentals.